All I needed to see was the second option in the Snacks section of The Family Dog menu. 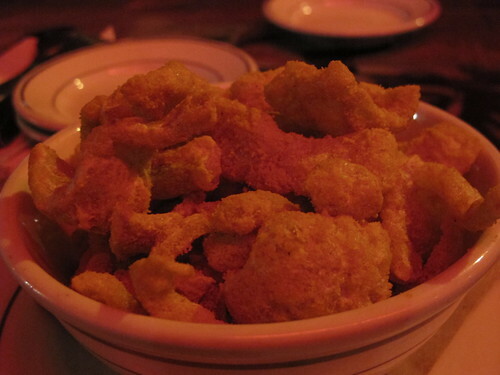 Underneath the intriguingly named Buford Highway Chex Mix is the dish Housemade Cheetos. One of my guilty pleasures, I sure that Cheetos, especially the puffs, have more in common with cardboard than any real cheese, but sometimes I just can’t resist the temptation of powdered cheese. Needless to say when I saw the words housemade and Cheetos, I knew that The Family Dog was a must; the included pork was just icing on the cake. First things first, we began with a bowl of Housemade Cheetos. I wasn’t exactly sure what to expect when I read the combination of pork and cheetos but cheese covered pork rinds made perfect sense. 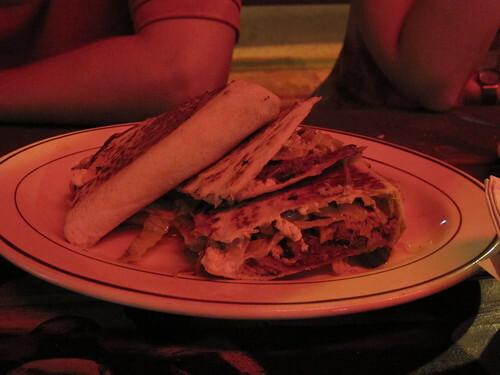 It’s little more than crunchy fried pork skin covered in powdered cheese, but it was fantastic. Of course we finished the bowl. 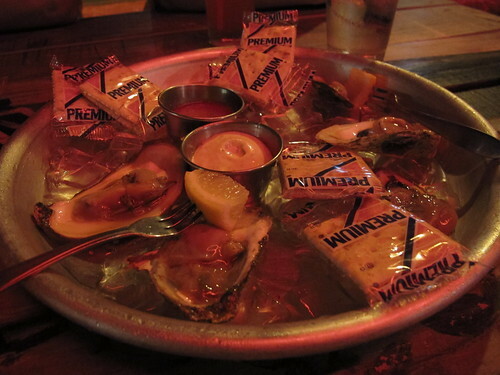 Apalachicola oysters on the half shell are hard to resist. In retrospect, the lobster eggrolls may have been a bad decision. This seemed to be skirting the edge of high-end stoner food and the combination of noodles and the doughy, take out eggroll wrapper didn’t do this dish any favors. What better way to enjoy The Family Dog’s selection of beers than with a pretzel? Once you made it past the salty, delightfully crunchy exterior, this dough was still steaming. 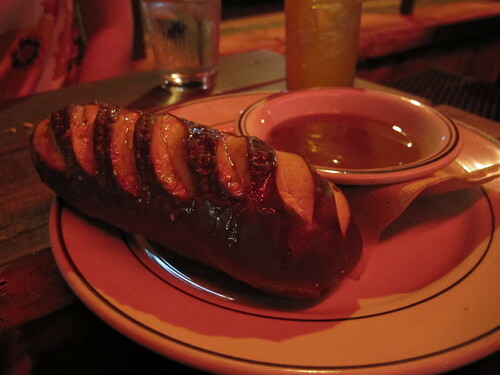 The dough’s sweetness was a nice feature but I would have preferred a more forward accompaniment than the house made honey mustard. It was too much in the vein of sweet and sweeter. 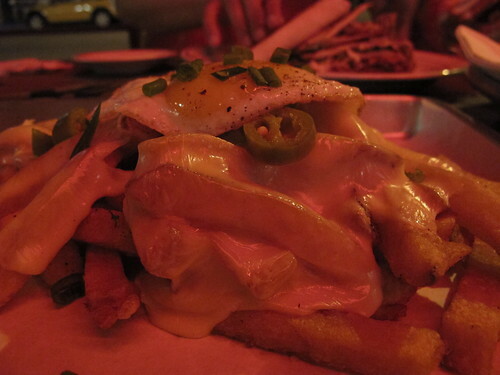 I’m not sure why they call them disco fries, but next to the table was an order of disco fries complete with marrow gravy, pickled jalapenos, American cheese, and a fried egg. This plate was too heart healthy, it was in obvious need of bacon. 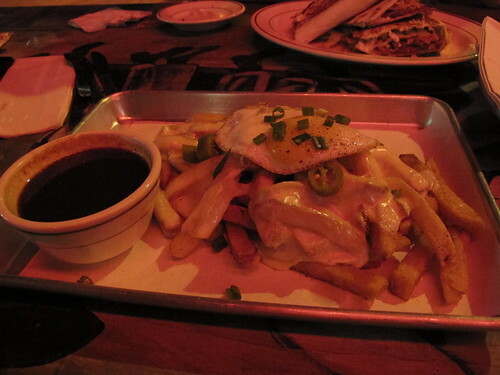 Actually, the fries were a little boring on their own. Thickly cut with a salty exterior and with a pillow like texture, these fries were pretty fair with the cheese, but they came into their own when combined with the gravy. 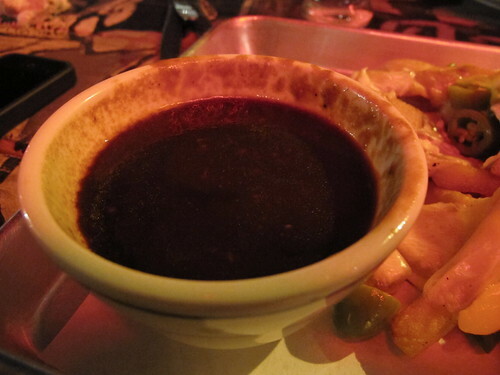 You might think it was more the gravy than the fries but the fries were more than just a vehicle for gravy intake, they made the beefy gravy that much better. It’s an example of the sum being greater than its parts. 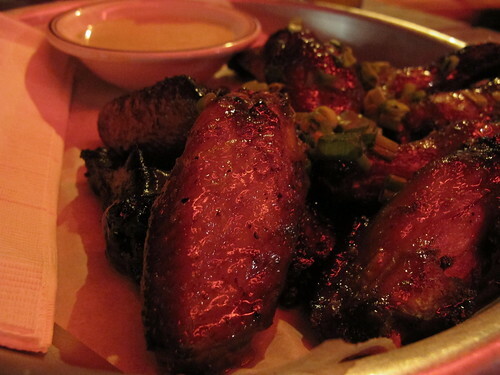 It only makes sense to order wings at a bar, and the twice-cooked Springer Mountain wings with an orange-curry glaze and avocado ranch were promising. 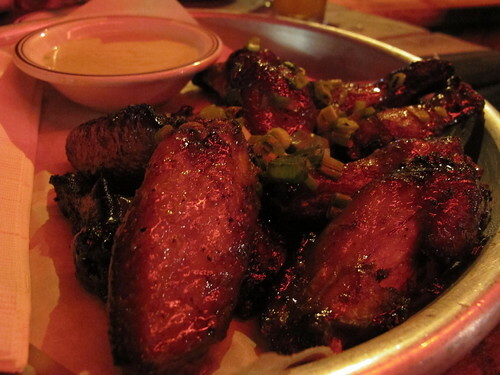 With the drumsticks, the twice-cooked preparation took its toll with dry meat but beautifully crispy skin. 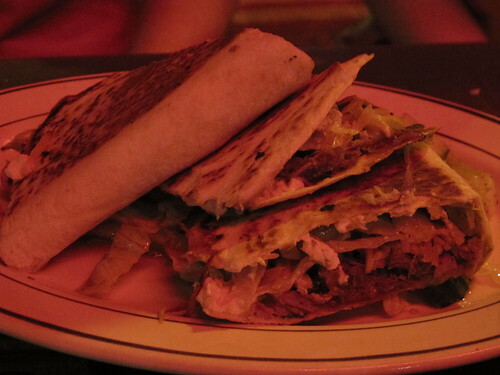 The wings fared far better and the avocado ranch played its creamy roll to a t.
Finishing out the meal was an order of the Korean duck quesadilla. There’s something about the combination of duck and cheese, it just doesn’t seem to work in my mind and it doesn’t work particularly well here. On its own the duck had nice soy sweetness and a hint of smokiness that was completely obscured by the cheese. I wouldn’t say that we left the Family Dog completely disappointed, but we were more than a little left down by what we received. 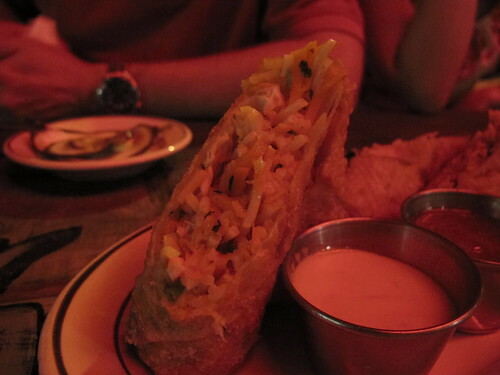 The ideas of several dishes, like the lobster eggrolls, are great, but the execution left us wanting for more. However,one particularly redeeming quality about The Family Dog is the size of the portions. The pretzels and fries were enough on their own, but I suppose we were a little ambitious when ordering. I wouldn’t mind returning to The Family Dog for cheetos & beer or to try out their burger, but outside of that, when I’m looking for a quality meal, I’ll just go across the street to Rosebud.